Velvet Cottage Self-cateringVelvet Cottage is a 3 STAR, family owned, 3 bedroom holiday cottage one and a half miles north of Llangollen. The fully furnished self catering accommodation is an ideal base for hill walking, mountain biking, canoeing, rock climbing or simply exploring the famous North Wales and Borderlands countryside, coast and mountains. 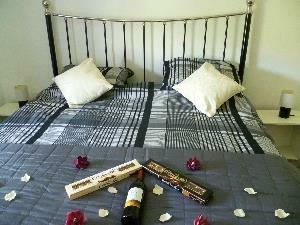 Velvet Cottage can provide accommodation for up to six occupants and is suitable for small parties or family groups. Full self catering facilities are provided, although there are many options for eating out locally or in Llangollen itself - the choice is yours! The accommodation is not suitable for wheelchairs due to the steep access steps and an internal staircase to the bathroom facilities. This Llangollen holiday cottage is available for rental on a weekly or weekend basis. To enquire about prices and availability, contact the provider. Large bedroom featuring a superking bed, bedside lamps, clothes storage and hanger rail. Velvet Cottage is a 3 STAR, family owned, 3 bedroom holiday cottage one and a half miles north of Llangollen. The fully furnished self catering accommodation is an ideal base for hill walking, mountain biking, canoeing, rock climbing or simply exploring the famous North Wales and Borderlands countryside, coast and mountains. On site parking, unlimited broadband, all fuel costs and UK phone calls included in price Children welcome from any age. Look for a left turn (Abbey Terrace) with a red telephone box on the corner. Turn LEFT into Abbey Terrace.